Wonderful 3 Bedroom Unit with Stunning Views - Great Family Retreat! Enjoy the privacy of this front and center first floor unit. 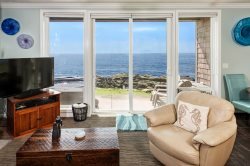 Take in the panoramic views of the waves and whales from your living/dining "great room" design. New concrete patio with unobstructed views without a railing and a new BBQ make your outdoor living area truly amazing. Large dining room table and beautiful kitchen with updated appliances, eating bar provide for great conversation and a breathtaking view. Bring the family, this beautiful unit sleeps up to 8*. Coastal Breakers features a new living room TV, new sleeper sofa, and beautifully appointed bedrooms with luxurious linens. We have rented before from you and once again it was a fantastic stay! Every experience with Blue Pacific has been fantastic! Loved the Location! Layout and cleanliness! Efficient and very courteous! Great service and quick responses to questions I had. I will definitely be back. It was perfect. Beautiful place and great price. Answered questions in a timely manner. Helpful and professional. Beautiful home, great views of the ocean. The clubhouse is wonderful. Very good website. Easy to navigate. Pics of unit were spot on. Email confirmation and information very detailed and easy to understand. he unit was amazing. Will definitely recommend to family and friends. We will Definitely be back! Great places to stay, easy reservations and great communication. Loved it again, second year in a row. Love the condo, great location, nicely furnished, very comfortable. Also the view is terrific!!! Kitchen has all the dishes, pots, pans, and appliances needed to make your stay comfortable. Very clean and well maintained condo. The rental was amazing the pictures were exactly as the place looked we had 4 adults and 3 kids and it was definitely enough space. We could have both showers going and they did not effect each other. We had plenty of amenities for the trip like dishwasher soap trash bags toilet paper. Beautiful view close to stores restaurants and not far from Walmart if we needed anything. Unfortunately we had to leave two days early because one of our group members received a call in the middle of the night that her home was engulfed in flames and burning to the ground. We packed our things and left immediately but we waited until morning to contact the condo representative to relay to them that we were gone and the reason for our early exit. Our options were explained to us by someone with compassion and professionalism.